Created in 2003, named after the novel Lavoura Arcaica by Raduan Nassar, in the context of sample culture, Lavoura has always worked in the frontier zones of electronics, jazz, popular culture, Brazilian, Latin, indigenous heritage and Africanisms. 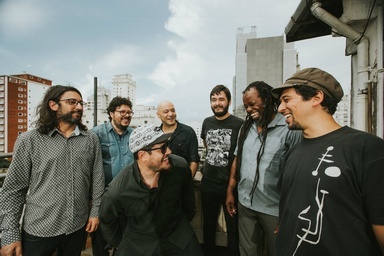 In 2005, two years after being created as a duo and releasing the demo Raízes Aéreas (2003) and the album Máquinas Híbridas (2004), the group established itself as a quartet and started to sound more organic, mixing 70´s groove with electronics and approaching of subgenres such as soulful, nu jazz, broken beats and future jazz. This quartet line lasted nine years and resulted in Kosmophonia (2008) and Nu Steps (2011). The group became a quintet in Photosynthesis (2014) and a septet in the series of singles Mirã, which begins with Ametista and MM Moods. The new compositions represent a breakthrough in terms of rhythmic, harmonic and melodic complexity. By blending genres, styles, territories and ambiences, Lavoura goes beyond categorizations and creates soundtracks for imaginary movies.